Lag can be caused by many different factors, however most often it's network related and usually resolves quickly. Ping spikes and packet loss are a major cause of lag and are often caused by congestion or interference on the route that is used for your data to travel from your personal computer to the server and back. This route often uses multiple networks which can contain different segments, an example of this is data traveling from your home network to the network of your internet service provider to that of a transit provider* and eventually to the network of the datacentre where your game/voice server is located. To find out where these ping spikes or congestion problems take place we will have to analyse the route used by your data to reach the server, this can be done manually with traceroute (which sends customized ping/ICMP echo messages across the path to find all routers which reply). 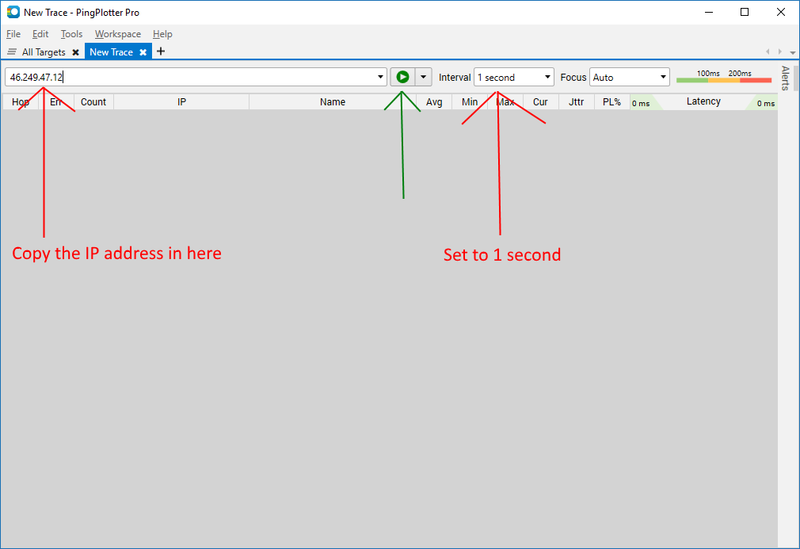 However there are better tools to analyse the network connection, such as WinMTR and PingPlotter, which can automatically send these traceroutes every few seconds to monitor the network over a longer period of time. *Sometimes internet service providers and datacentres can connect with each other directly by peering (This usually happens in a 'Internet Exchange') but most often they use 'transit provider'. These transit providers are specialised in connecting networks and are often called the backbone of the internet because they operate infrastructure around the globe to connect many networks over larger distances. These companies are sometimes referred to as tier one network operators. What is PingPlotter? What does the output mean? What are common network issues and resolutions? 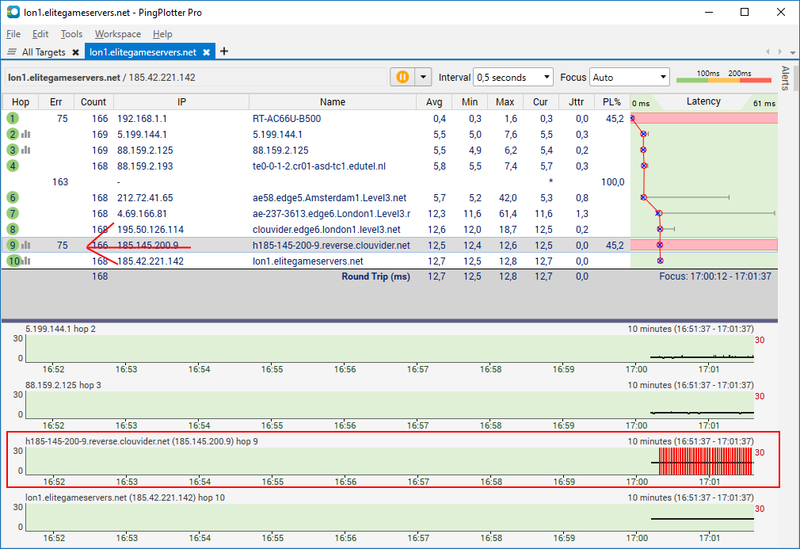 PingPlotter is a network troubleshooting and diagnostic tool. It uses a combination of traceroute, ping, and whois to collect data quickly, and then allows you to continue to collect data over time. PingPlotter will then display this data in a graph which will make it easy to pinpoint where the problems are and when they occured. The PingPlotter report shows the route that is used for data packets to travel to their destination and if there are issues on the way. Each "hop" (numbered on the left hand side) represents a router your data is traveling through. The first few hops are local, hop #1 normally being your home router or modem. The middle hops are normally your ISP and transit providers, and the last few hops are the destination, in this case the datacenter network and our server. Packet loss is an indication of information being lost along the way. 100% packet loss is an information stoppage. 100% packet loss on the first, second, or third hop is normally an indication of a firewall, antivirus program or router blocking internet access or not responding to ICMP Echo requests. Partial packet loss in the first few hops may be caused by bad network drivers or hardware, or using a bad medium for network connectivity (e.g. damaged network cable's, Wi-Fi that is experiencing interference) or by overloading the network (e.g. by downloading or uploading a lot of data or by sharing the connection with other users). If the issue happens on the first few hops after your local network then this is usually an ISP issue, and requires contacting your ISP to resolve the problem. We recommend using a decent ISP that uses a wired method of connecting networks. For stability it's best to use a non-oversubscribed line that is dedicated for you, for example fibre to the home when available or ADSL would be great because there are no other users on these lines. Other options are COAX/Fibre to the cabinet, but you usually share these lines with your neighbours and we've seen some cases where this can cause issues because the line didn't have enough capacity for all these users (especially during peak hours, when most people are at home and surfing the Internet). Using a mobile or wireless ISP that providers 3G or 4G internet is not recommended due to the additional latency and packet loss that can occur because of interference with other wireless media. Most of these networks outside your ISP's network are monitored 24/7 by network administrators who monitor their infrastructure for packet loss and latency/ping spikes to detect outages and capacity problems. Most network infrastructures are redundant, in case of a problem the system will automatically try to failover to an alternative device or alternative route after a short period. This can sometimes result in a short outage (<2 minutes) and higher latency. If outages last for more than 10 minutes or occur on a regular base, then please contact us so we can investigate and inform the network administrators. If the ping/latency increases substantially or is very unstable for more than one hour, or if it happens several times a week, then please also contact us. How do I use PingPlotter? Please let us know your WAN IP address (Wide Area Network Internet Protocol) and the name of your ISP (Internet Service Provider). Close all open applications including torrents, DC-clients, ICQ, Web Browsers (IE, Firefox, Chrome, Opera and the like), and Mail clients, etc...as these can interfere with the connection test results. Also turn off all other computers in your local network. The trace interval should be set to 1 seconds. Please type or copy the IP of your server in the "Enter targete name or IP" field. Make sure you remove the the port and the : (column) from the IP address. For example if your server's IP and port is 46.249.47.12:2513 in our game server control panel, then the IP would be: 46.249.47.12. Now please double click on each of the bottom hops, so that each hop has it's own graph. Please allow Pingplotter to run for at least 15 minutes, while you experience network problems. 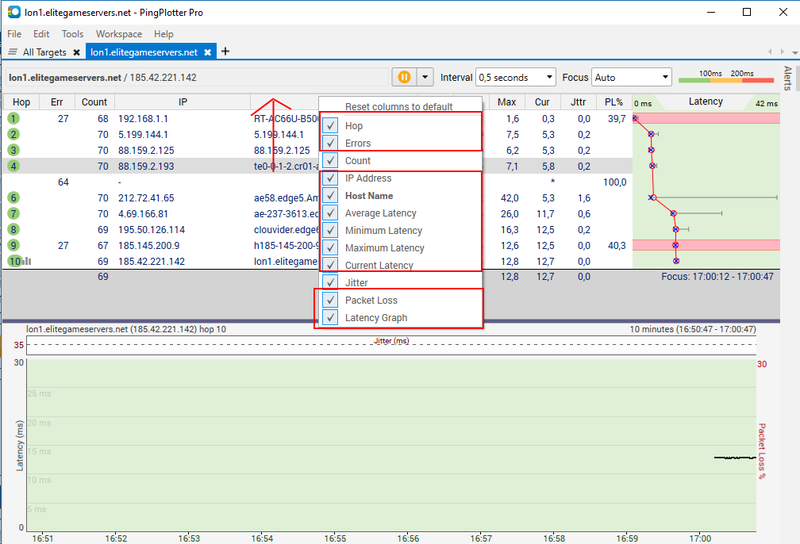 Problems can be spotted by periods with lots of packet loss or high latency. These can be visualized in the PingPlotter graphs as red blocks or spikes and steep spikes in the latency. Finally, please click "file" (in the upper left hand of you screen), then "export sample set > all data." Also do a save as image, make sure the save as type for the image is PNG. Please save the .png image and the .pp2 file and attach them to your ticket. Some of the datacentres we work with require the use of MTR for troubleshooting and analysing network problems. It might be smart to download WinMTR from http://winmtr.net and run this at the same time as PingPlotter, It's very easy to use, simply type the IP from step 5 in the host field and click start. Once done you can click stop and click the copy text to clipboard. You can then paste this in the support ticket so we can forward it to network engineers in the datacentre. Can I use the server's default port? How can I login directly to controlpanel?